Robert E. Jackson, Jr., M.D. 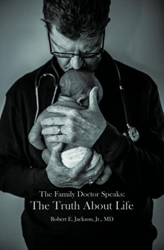 Robert E. Jackson, Jr.‘s new book The Family Doctor Speaks: The Truth about Life ($20.99, paperback, 9781498499453; $9.99, E-book, 9781498499460) tackles difficult social/moral issues in a sincere, straightforward, and compassionate manner by a family doctor who is on the front lines of the ethical battle every day. The ease and simplicity with which he introduces the truth of God's Word into very difficult ethical issues makes this a must read for medical professionals, church staff, and lay people committed to sharing God's truth in a loving way to their circles of influence. The doctor's anecdotes provide much food for thought and a good example to follow. No circumstance, no matter how desperate, justifies the killing of unborn children by abortion, handicapped children by infanticide, or the infirm by euthanasia. The Truth about Life details Dr. Jackson's prolife journey from an uninformed, nonchalant Christian to an ardent, prolife advocate. Dr. Jackson, a family physician since 1981, married his beloved wife, Carlotta, in 1981. They are the parents of nine children, two of whom have special needs. Dr. Jackson cofounded the Carolina Pregnancy Center in Spartanburg, South Carolina, and served as its chairman for 13 years. For his ongoing prolife work he was awarded South Carolina's highest civilian award, The Order of the Palmetto, and his denomination's award for "exemplary Christian service." Serving also in various church positions and denominational committees throughout his adult life, he has traveled to multiple countries on mission trips. He currently is leading his church to minister to an unreached people group in northeast India. Xulon Press, a division of Salem Media Group, is the world’s largest Christian self-publisher, with more than 12,000 titles published to date. Retailers may order The Family Doctor Speaks: The Truth about Life through Ingram Book Company and/or Spring Arbor Book Distributors. The book is available online through xulonpress.com/bookstore, amazon.com, and barnesandnoble.com. Media Contact: Robert E. Jackson, Jr., M.D.